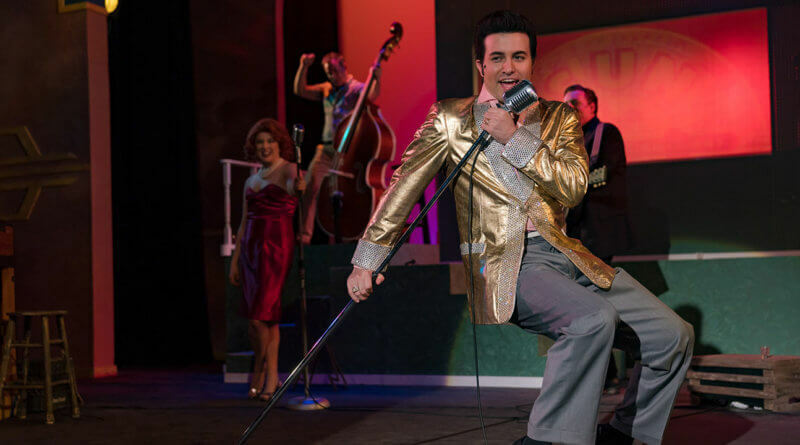 Million Dollar Quartet, the Tony Award-winning jukebox musical, arrives at the Public Theater of San Antonio in an exuberant production. Reimagining the legendary day in 1956 when four musical legends held an impromptu jam session at Memphis’s Sun Record Studios, it is highlighted by outstanding performances and terrific musicianship. The actual Million Dollar Quartet at the Sun session. In the show, Carl Perkins arrives at Sun Records to lay down some tracks for owner Sam Phillips. 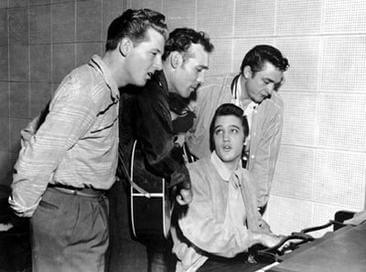 He is joined by Jerry Lee Lewis, Johnny Cash and finally Elvis Presley, who is accompanied by his girlfriend, Dyanne. Though all of these young men are on different paths, they all owe Phillips a debt of gratitude for their careers, and this chance reunion becomes the session that they perform for their beloved boss. It’s a bittersweet reunion, however, as the boys are all getting ready to move on. Phillips had already sold Presley’s contract to RCA to save his hide, but the mainstreaming of rock and roll means that wealthier labels are coming for his talent. As a matter of fact, when Phillips offers Cash a contract renewal, the singer confesses that he’s been signed by Columbia. Perkins admits that he is leaving, too. Only the young upstart Lewis remains. The Public Theater’s production is sensational. Smoothly directed by George Green, it features Tyson Gerhardt as Perkins, Kavan Hashemian as Presley, Stephen Horst as Cash and Gavin Rohrer as Lewis. 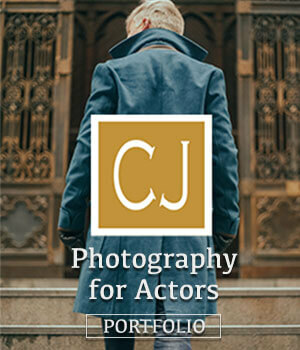 Fine singers and instrumentalists all, they’ve played these roles all around the country, and their experience shows. They inhabit these personas with authority — and can they jam! 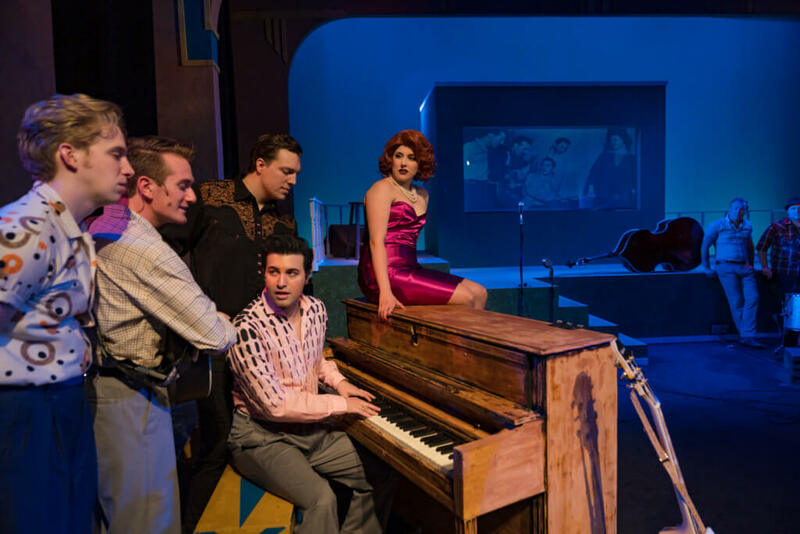 L-R: Gavin Rohrer, Tyson Gerhardt, Kavan Hashemian, Stephen Horst and Taylor Chilton in Million Dollar Quartet, now playing at the Public Theater of San Antonio. Taylor Chilton is fine as Dyanne (and she delivers a smokin’ version of “Fever”). Jeff Jeffers is a poignant Phillips, wistfully watching the genre that he helped to invent slipping away from him. Nathan Yates Douglass and Eric Engleson also add their welcome musical voices as session players Brother Jay and Fluke. 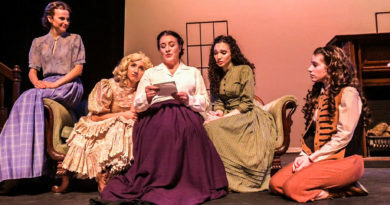 From a technical standpoint, the Public’s staging is up to its usual high standards, with an evocative set by Jeremy Whittington, atmospheric lighting and sound design by Dan “Doc” Heggem and Jesse Worley, and period-perfect costumes and choreography by Sarah Brookes and Courtnie Mercer. 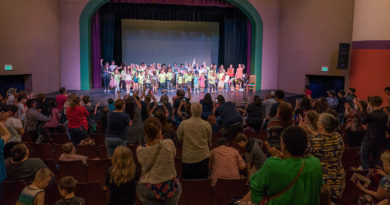 The show is a goldmine for fans of these artists, as it includes such favorites as “Blue Suede Shoes,” “Great Balls of Fire,” “Hound Dog,” “Who Do You Love” and “Folsom Prison Blues,” to name a few. 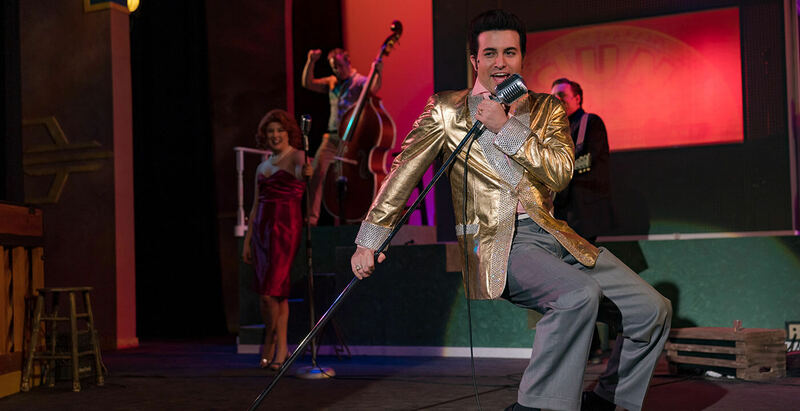 Million Dollar Quartet plays Fridays and Saturdays at 7:30 p.m. and Sundays at 2:00 p.m. through Apr. 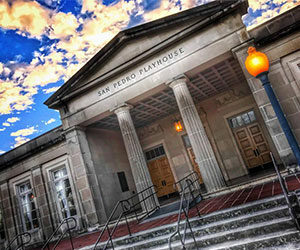 14 at the Public Theater of San Antonio, 800 W. Ashby Pl. Reservations can be made online or by calling (210) 733-7258.